Research in the Capaldi Laboratory in the Institute of Molecular Biology and Dept of Biology at the University of Oregon, and more recently also at MitoSciences Inc, and Metabolic Profiling Inc, has focused on the structure and function of mitochondria in health and disease. Mitochondria function broadly in cell metabolism, including in glucose metabolism (Krebs cycle and oxidative phosphorylation), in fatty acid oxidation, and in nitrogen metabolism (via the urea cycle). They are also involved in cell signaling, and are key to initiation of autophagy and apoptosis. Further, mitochondrial dysfunction is now known to be central to Alzheimers, Parkinsons, diabetes and cancer, and there are also several genetic diseases of mtDNA. Margineantu, D.H., Capaldi, R.A. and Marcus.A.H. 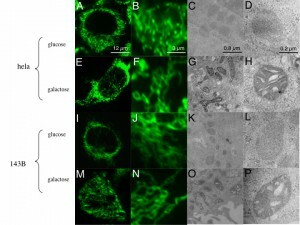 (2000) Dynamics of the mitochondrial reticulum in live cells using patterned fluorescence correlation spectroscopy and digital video microscopy. Biophys. J., 79, 1833-1849. Margineantu, D.H., Cox, W.G., Sundell, L., Sherwood, S.W., Beechem, J.M. and Capaldi, R.A. (2002) Cell cycle dependent morphology changes and associated mtDNA redistribution in mitochondria of human cell lines. Mitochondrion, 1, 425-435Knowles, M.K., Guenza, M.G., Capaldi, R.A. and Marcus, A.H. (2002) Cytoskeletal-assisted dynamics of the mitochondrial reticulum in living cells. Proc. Natl. Acad. Sci. USA, 99, 14772-14777. Darley‑Usmar, V.M., Kennaway, N.G., Buist, N.R.M. and Capaldi, R.A. (1983) Deficiency in ubiquinone cytochrome c reductase in a patient with mitochondrial myopathy and lactic acidosis. Proc. Natl. Acad. Sci. USA 80, 5103‑5106. Carrozzo, R., Murray, J., Capuano, O., Tessa, A., Chichierchia, G., Neglia, M.R., Capaldi, R.A. and Santorelli, F.M. (2000) A novel mtDNA mutation in the ATPase 6 gene studied by E. coli modeling. Neurol. Sci. 21, S983-984. Hanson, B.J., Carrozzo, R., Piemonte, F., Tessa, A., Robinson, B.H. and Capaldi, R.A. (2001) Cytochrome c oxidase-deficient patients have distinct subunit assembly profiles. J. Biol. Chem., 276, 16296-16301. Rossignol, R., Gilkerson, R., Aggeler, R., Yamagata, K., Remington, S.J. and Capaldi, R.A. (2004) Energy substrate modulates mitochondrial structure and oxidative capacity in cancer cells. Cancer Res., 64, 985-993. Chi, S.L. Wahl,M.L, Marusich,M.F., Capaldi,R.A., Dewhirst, M.W and Pizzo.S.V. (2007). Angiostating-like activity of a monoclonal antibody to the catalytic subunit of F1F0ATP synthase. Cancer Res. 67. 4716-24. Taylor, SW., Warnock, D.E., Glenn, G.M., Zhang, B., Fahy, E., Graucher, S.P., Capaldi, R.A., Gibson, B.W. and Ghosh, S.S. (2002) An alternative strategy to determine the complete mitochondrial proteome using sucrose gradient fractionation and 1D Page on highly purified heart mitochondria. J.Proteome Research, 1, 451-458. Schilling, B., Bharath, S., Row, R.H., Murray, J., Capaldi, R.A., Freed, C.R., Prasad, K.N., Andersen, J.K. and Gibson, B.W. (2005) Rapid purification and mass spectrometric characterization of mitochondrial NADH dehydrogenase (Complex I) from rodent brain and dopaminergic neuronal cell line. Mol. Cell Proteomics., 4, 84-96. Capaldi, R.A. (1996) The complexity of a respiratory complex. Nature Struct. Biol. 3, 570-574. Gogol, E.P., Johnson, E., Aggeler, R. and Capaldi, R.A. (1990) Ligand-dependent structural variations in Escherichia coli F1 ATPase revealed by cryoelectron microscopy. Proc. Natl. Acad. Sci. USA 87, 9585-9589. Wilkens, S. and Capaldi, R.A. (1998) Two stalks link the F1 to the F0 part in the E. coli ATP synthase. A rotor and a stator? Nature, 393, 29. Wilkens, S. and Capaldi, R.A. (1998) Solution structure of the e subunit of the F1 ATPase from E. coli and interactions of this subunit with b subunits in the complex. J. Biol. Chem. 273, 26645-26651. Capaldi, R.A. and Aggeler, R. (2002) Mechanism of the F1F0-type ATP synthase: a biological rotary motor. Trends Biol. Sci. 27, 154-160. Our ongoing work is focused on the ATP Synthase. 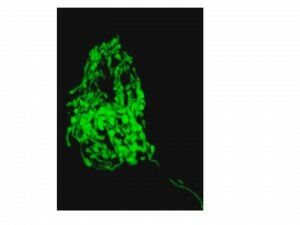 Briefly, this enzyme is now known to be present on the plasma membrane as well as in mitochondria in some cells. The levels of the ectopic ATP synthase are highest in cancer cells where the enzyme acts to modulate cytosolic pH in the acid environment of the tumor. It is present in high levels on liver cells and acts as an HDL receptor. Levels are also high in endothelial cells of blood vessels. Here the ectopic ATP synthase is sensitive to shear force, which releases a subunit of the enzyme to modulate blood pressure. Further, in neuronal cells the ectopic ATP synthase has been identified as a receptor for beta amyloid (in Alzheimers disease) and for viruses such as HIV/AIDS. We want to know more about how a large enzyme complex, in which some of the subunits are encoded on mtDNA and made on ribosomes inside mitochondria, gets to the plasma membrane. Also, we are screening for compounds that can selectively modulate the various properties of the ectopic ATP synthase with the aim of treating the several human conditions in which the enzyme plays an important role.